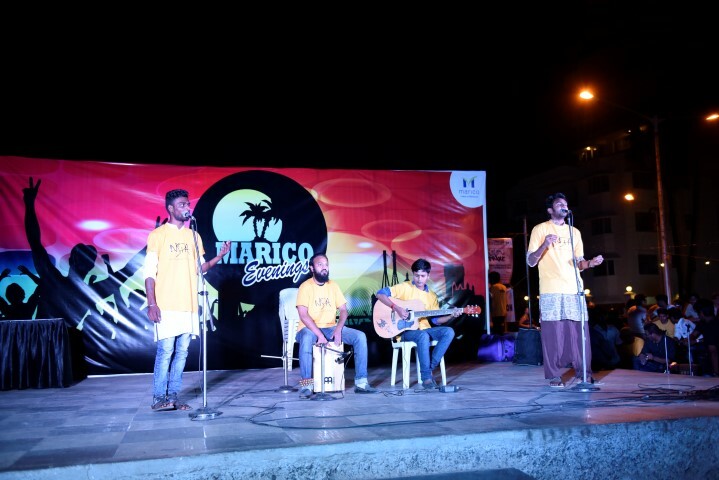 After days of anticipation and excitement, the mega music event, ‘Marico Evenings’ finally happened. The setup was beautiful. A colorful backdrop dressed the stage and rows of multi-colored lights set the mood for the evening. As the sun continued its downward march, the seats began to fill up, and as if competing with that great ball of fire, the audience seemed to want to fill the venue before the sun could make a graceful exit. They sure did succeed, for within minutes, every chair was occupied! Ones who couldn’t find a seat chose to watch the performances standing, and soon, a thick, snake-like line began to form around the venue. The evening kicked off with a bang with our theatre enthusiasts, ‘Natakwale,’ presenting a thought-provoking drama. 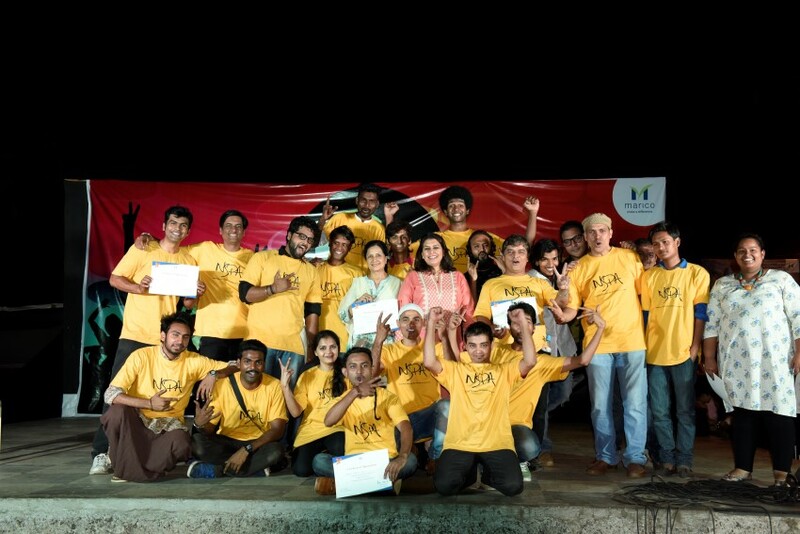 Their play tackled an issue that has been a cause for much concern of late; the safety of women in society. Through witty dialogues laced with a generous dose of sarcasm, they forced us to question and rethink some of the misogynistic attitudes we hold towards women. They also appealed to the audience to be more vigilant regarding the issue of women’s safety while also suggesting measures women could take in order to protect themselves better. To liven up the atmosphere and infuse melody into the thoughtful silence that followed the play, our next performers, 9 Beat, took to the stage. 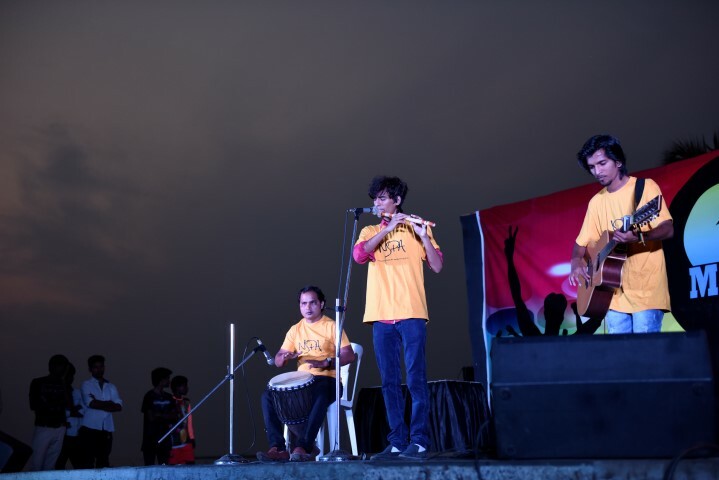 Armed with their simple instruments which included a flute, a guitar and a djembe, this team of three serenaded the audience with their harmonious instrumental compositions. A sense of calm permeated the atmosphere and you couldn’t help but close your eyes and relax as the melodious notes washed over your senses. After this soothing performance, it was time to bring on an interesting mix, a performance that blended Middle Eastern and Western musical influences. 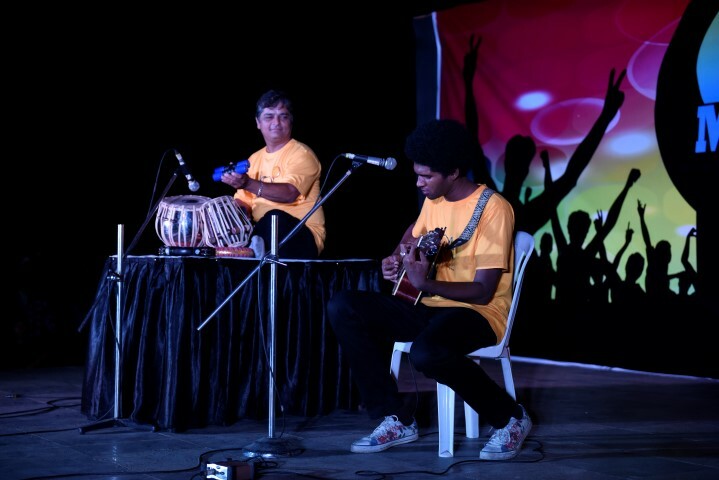 While the guitarist strummed gently and sang popular English numbers, a deftly played tabla kept time to his strumming, delivering the right beats at the right time. Next, it was time for some Sufi music and who better to give us this soulful treat than the very popular RAM-Trio. 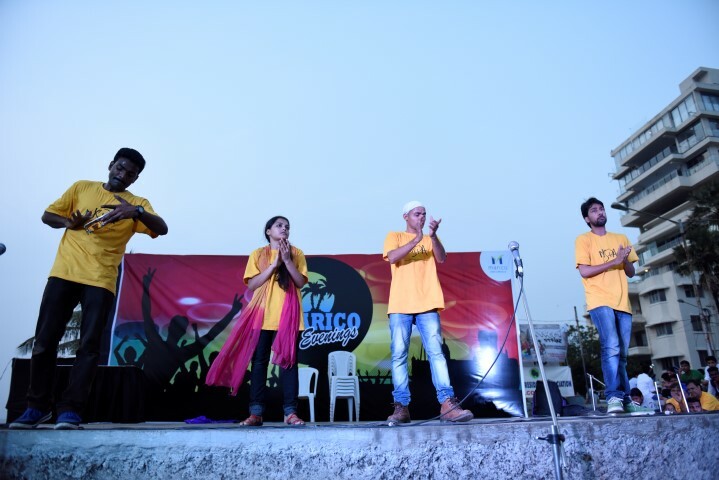 They took to the stage and belted out some popular numbers like ‘Piya Re,’ ‘Allah ke Bande Haste,’ and ‘Dama Dum Mast Kalandar.’ Their heartfelt, poignant performance appealed not just to the senses but to the soul too and one could feel the magic of Sufi music take over. Up next was a performance that presented a mix of styles. 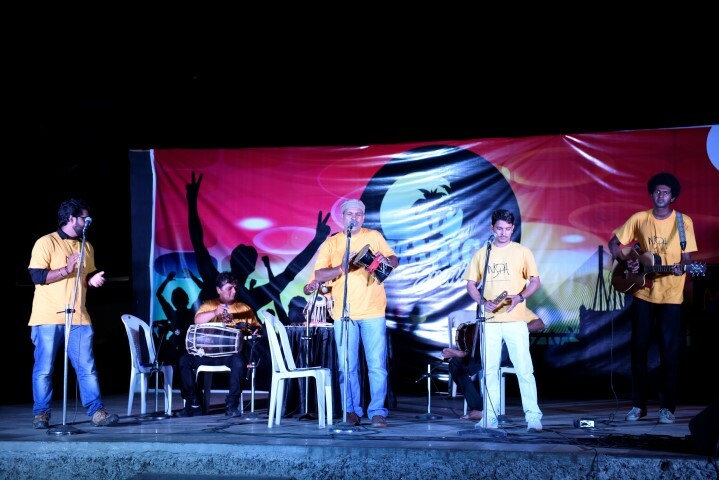 From Uttarakhandi folk to Uttarbhartiya folk to Punjabi folk to Lavani, One Nation, One Music presented an eclectic mix of styles that kept the audience enthralled and energized. One couldn’t help but clap to the beat and sing along! We reached the end of the evening and what better way to conclude an event as energetic as this than by another power-packed performance! The Drum Circle, a band that creates rhythmic music using percussion instruments like the cajon, djembe, dhol, tabla and symbols were called upon to deliver this spirited closing. And did they wow the audience! One could see feet tapping and heads nodding everywhere. 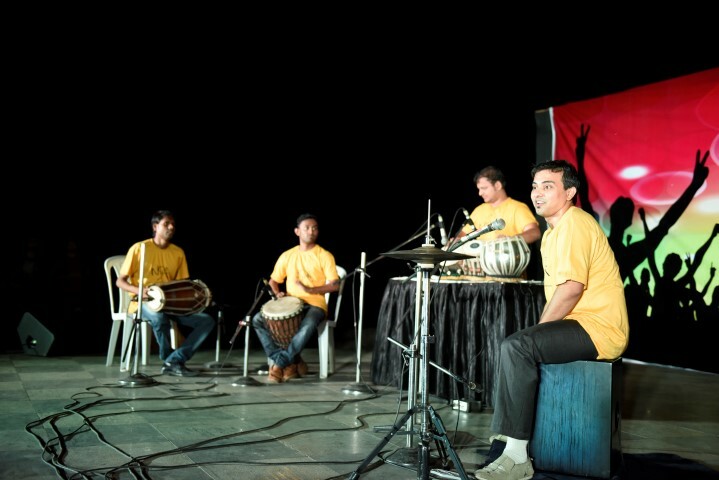 The reverberating beats seemed to energize the audience and they began to cheer with newfound vigor and enthusiasm. Way to go Drum Circle! Finally, it was time to bid adieu to the audience and thank them for their support. However, before we could sign off, our artists were treated to a happy surprise. To congratulate and thank them for their fabulous performances, a certificate of appreciation was awarded to them on behalf of Marico Evenings! How cool is that! For more photographs from the evening, check out the ‘Marico Evenings‘ album on Facebook.